The Coromandel Ramblers Cricket Club is proud to organise and run a Woolworths Junior Blasters Centre (formerly Milo in2CRICKET) within the local community. This Cricket Australia devised program develops the basic skill sets for all future cricketers at all levels of the game. This program is specifically devised for 5 to 8 year olds who wish to develop the basic skills in a family friendly environment. All participants receive a ‘starter pack’, which contains everything that the next Australian cricketer will need to play cricket in the backyard or at these sessions. The Coromandel Ramblers Cricket Club will be running these sessions in Term 4, starting on the 12th of October 2018 . Each Woolworths Junior Blasters sessions will be held on a Friday night from 6:15pm until 7:15pm. BBQ’s and soft drinks will also be provided for a minimal cost at each session, so there is no need for mums and dads to cook dinner for the night. Costs for the program will be $80, for which a “starter pack” is provided to each individual. This pack contains all of the essentials for the next Ricky Ponting to start their journey to cricketing stardom. If your son and/or daughter would like to participate in the club’s Woolworths Junior Blasters program, then they can be registered at the Coromandel Ramblers Cricket Club Junior Blasters Registration site. If you require any further information on this, the feel free to contact Mandy O'Keefe through the details listed on the contacts page. 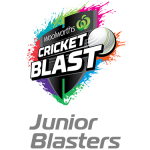 In addition, more information about the Woolworths Junior Blasters program can be found at Cricket Australia’s Junior Blasters website. You never know, but they may be starting their pathway to representing Australia at the highest level!